CASE STUDY — In 2011, Medford, Oregon, faced a problem common for cities nationwide. Upon treating sewage from nearly 200,000 people, the city’s wastewater treatment plant discharges an average of 17 million gallons of clean — but warm — water to the Rogue River every day. Here’s the challenge: The historically cold Rogue River is already warming, and the water the facility is returning to the river could increase its temperature by an additional 0.18 degree Celsius. Warmer rivers have less oxygen and cause eggs to incubate earlier, decreasing survival rates. To comply with the Clean Water Act, the city had to offset the impact of its warm-water discharge. Fortunately, there was no shortage of options in front of plant employees like Tom Suttle. Cooling towers or chiller could be installed. Water could be held in ponds until it was at the appropriate temperature. Warm water could be reused elsewhere. The problem? “All of those were very expensive,” said Suttle. Tom Suttle is the Water Reclamation Division Construction Manager for the City of Medford, Oregon. Chillers and storage lagoons can cost $15 million. Reusing water elsewhere could cost $40 million. The Freshwater Trust offered the city something different; a solution that stood out next to the engineered proposals in terms of both dollars spent and benefits received. The city could instead pay landowners to plant trees along their stretch of the river to shade the stream and keep the water cool. The bill for taxpayers? Approximately $6.5 million – a more than $8 million savings. And the benefits of those trees would extend far beyond producing shade for fish. They filter pollutants like agricultural runoff, reduce carbon in the atmosphere, and provide essential habitat for wildlife. 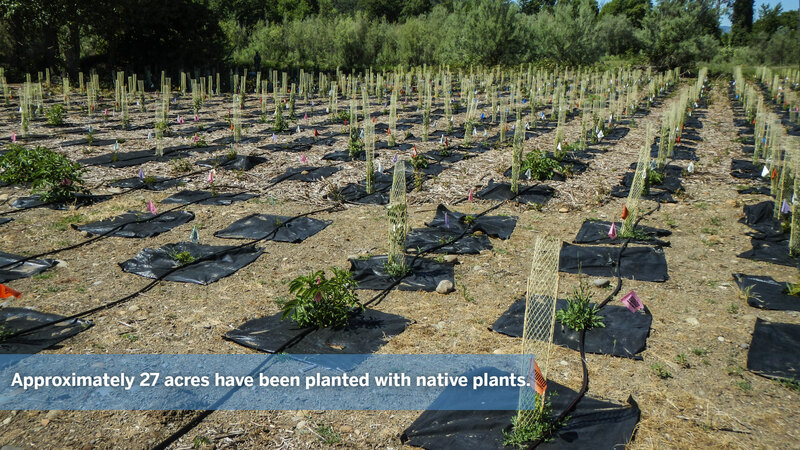 Approximately 27 acres or 3.6 miles of stream have been planted with native plants. The proposal was accepted, and a first of its kind, regulator-approved water quality trading program was born to meet the temperature requirements. Shade generated from trees planted would be quantified and expressed as credits that the city could purchase. The credits are tracked in kilocalories. A kilocalorie represents the amount of energy required to raise the temperature of a liter of water by 1.0 degree Celsius. One credit equals one kilocalorie per day. 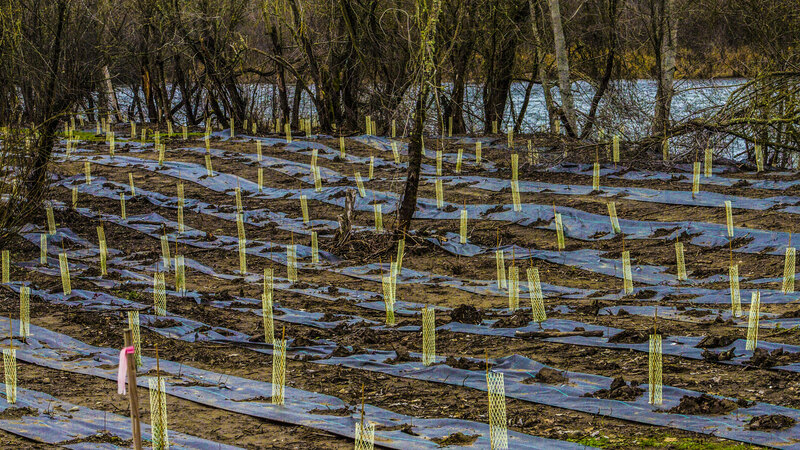 To ensure planting would indeed mitigate the plant’s impacts on the river, trading is done at a 2 to 1 ratio. 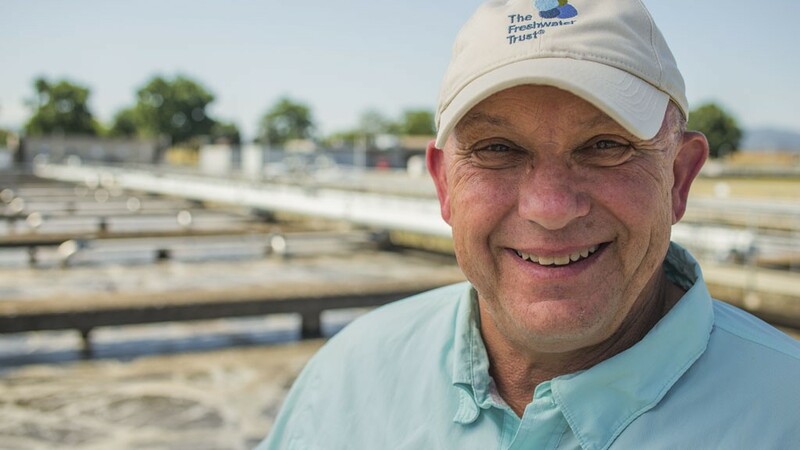 The Freshwater Trust was tasked with generating 600 million temperature credits to offset the wastewater treatment plant’s future obligation to mitigate 300 million kilocalories per day of impact on the river. This approach to restoration is defined by The Freshwater Trust as Quantified Conservation. It’s the method of using data and technology to ensure that every restoration action taken translates to a positive outcome for the environment. 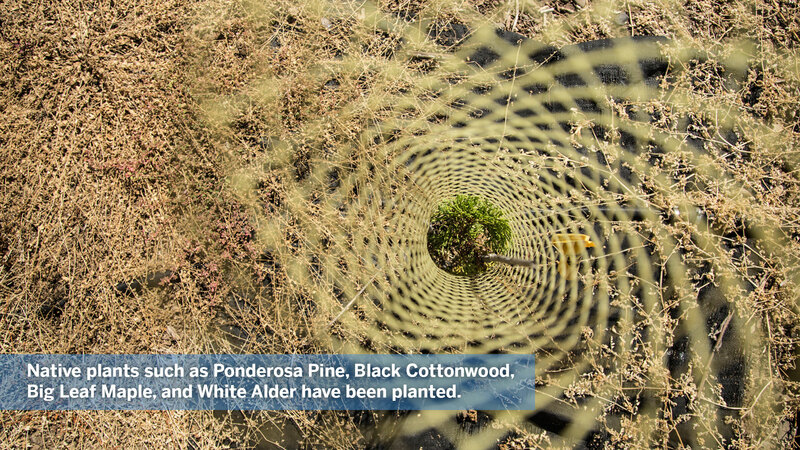 So far, 27 acres or 3.6 miles of stream have been planted with native plants such as Ponderosa Pine, Black Cottonwood, Big Leaf Maple, Oregon Ash and White Alder. Leases with landowners are for 20 year periods, giving The Freshwater Trust the opportunity to maintain the project sites, ensure the native trees flourish, and keep the invasive plants at bay. But The Freshwater Trust doesn’t carry out this project alone, and that means the economy benefits. It’s a collaborative effort with many local business involved. The thousands of trees put in the ground are grown by Graig Delbol, owner of Althouse Nursery in Cave Junction, Oregon. 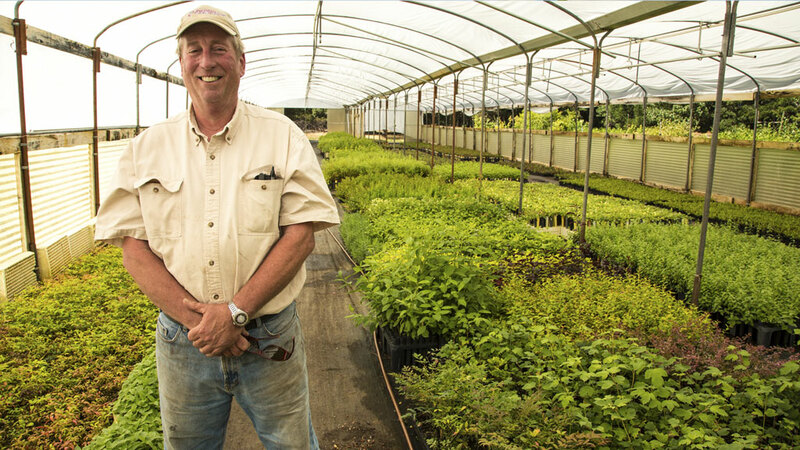 Graig Delbol, owner of Althouse Nursery in Cave Junction, Oregon, grows many of the trees we use in this project. Local father and son team Dan and Dave Bish of Plant Oregon, a family owned nursey in Talent, Oregon, then step in for planting and maintaining. The project is a win-win for both the economy and the environment. 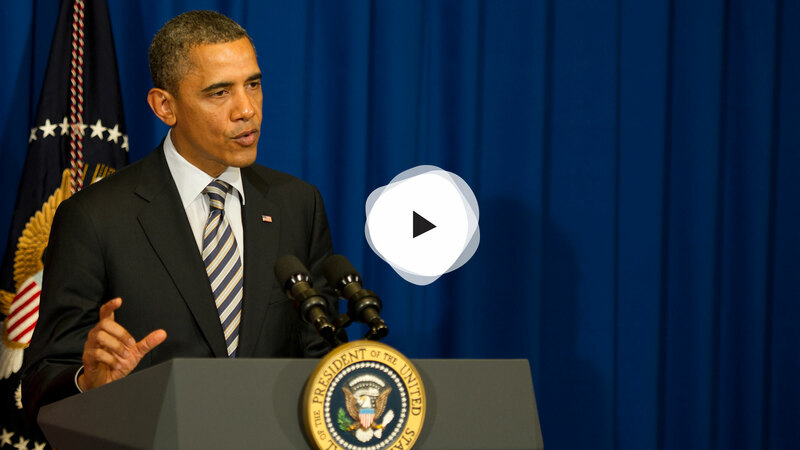 Many agree, including President Obama who highlighted the program during the 2012 White House Conference on Conservation. Check out the piece in Scientific American about this program. To learn more about solutions that benefit the environment and the economy, continue reading about our compliance solutions. Questions about our Medford program? Contact Denis Reich, Recruitment & Southern Oregon Program Director. Water quality trading is an offset program that is similar to carbon credit programs. Trading allows regulated entities---such as the City of Medford---to purchase credits tied to environmental benefits for compliance purposes. Water quality trading is supported by the U.S. EPA and is active in Oregon where the city of Medford and Clean Water Services, a water resources management utility of Oregon’s Tualatin River Watershed, have trading written into their wastewater discharge permits as options for temperature compliance. Many municipalities have now found themselves with new temperature limits in their discharge permits. As these facilities continue to grow, they will likely find themselves to be slightly out of compliance with the temperature limits listed in their wastewater discharge permits for only a month or two out of the year, when fish spawning and rearing are occurring. Therefore, the temperature benefits that the shade from a tree creates can be accurately calculated and modelled, which means that streamside plantings – within a reasonable distance from the discharge point – make for an ideal source of environmental benefits to offset the warm-water discharge. Trading is often a cost-effective and holistic “green infrastructure” solution when compared to built “gray infrastructure” solutions at the wastewater plant for water quality compliance. It’s important to note that the Medford facility is eligible for trading because the facility’s discharge is not causing a localized temperature impact that would harm local fish populations. 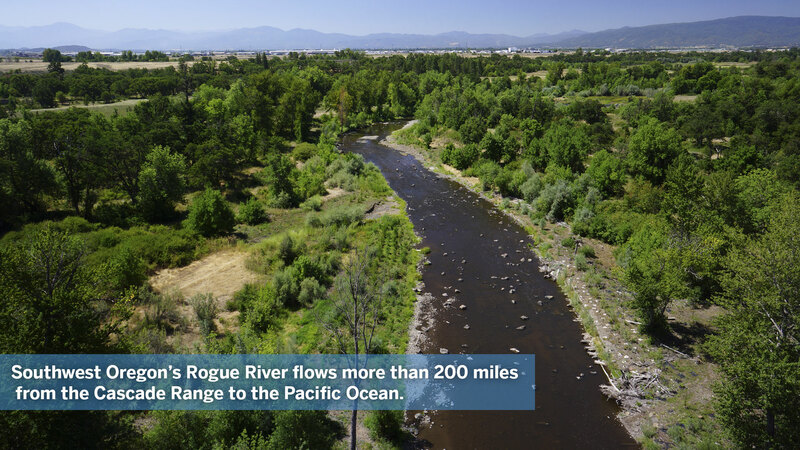 Medford’s discharge is safe for fish because it contributes a small portion of warm water to the larger temperature problem of the Rogue River. How are temperature impacts evaluated? A temperature limit is placed on the Medford facility by the Oregon Department of Environmental Quality (DEQ) and is articulated as a thermal load limit that is expressed in kilocalories per day. A kilocalorie is a unit of energy. One kilocalorie represents the amount of energy required to raise the temperature of a liter of water by 1.0 degree Celsius (or about a quart by 1.8 degrees Fahrenheit). Working with the city, The Freshwater Trust estimated current and future impacts of the facility’s warm water discharge on the Rogue River and determined that the facility could potentially exceed their temperature limit by 300 million kilocalories per day at certain times of the year. So that is the amount of energy that would have to be removed from Medford’s discharge to comply with the new limits. How are credits calculated and generated? One credit equals one kilocalorie per day. For trading in Oregon, offsets must happen at a 2:1 ratio. In other words, to account for every kilocalorie of temperature impact, two kilocalories of benefit must be generated. This ratio accounts for the fact that trees and plants will spend their first few years growing before they mature and begin to provide significant shade. Medford must acquire 600 million temperature credits to offset its 300 million compliance obligation. Credits must be generated from restoration actions that meet rigorous quality standards, and all credit-generating planting sites are reviewed by a third-party verifier. For transparency, credits are also registered on a third-party web registry. Why does the City of Medford get credits after trees are planted even though those trees aren’t yet providing full shade? 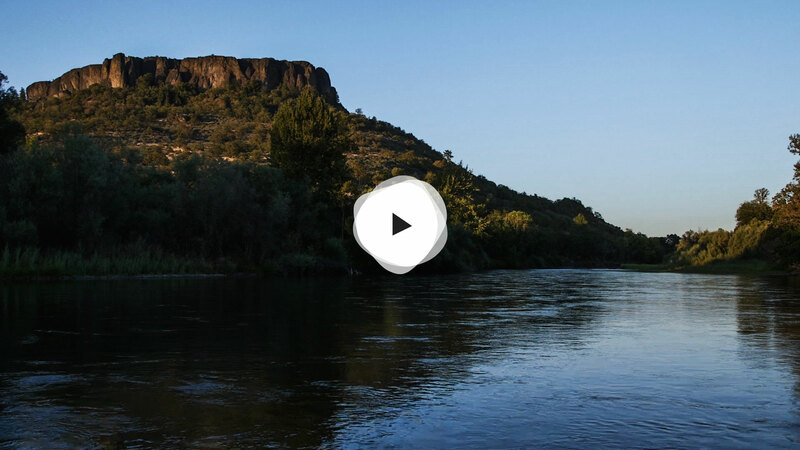 The Oregon Department of Environmental Quality (DEQ) approved this arrangement because it wanted to incentivize quicker, bigger investments to address river degradation and loss of aquatic habitat—a key limiting factor contributing to water quality issues in the Rogue River Basin. To account for the period where trees are growing, DEQ applied a 2:1 ratio to Medford’s exceedance. The DEQ’s decision is further supported because the City is building shade credits in anticipation of a projected future exceedance from its wastewater treatment facility, and because the facility’s discharge is not currently causing hot spots that would endanger aquatic biota such as salmon. How much forest will be restored by the program? The program will generate approximately 100 acres of restored riparian habitat (streamside forest) within the trading area established by Oregon DEQ. This area includes a section of the Rogue River near the Medford facility, the Applegate River, Little Butte Creek and Evans Creek. How much does the program cost? How does that compare with other compliance solutions? The City of Medford’s water quality trading program will cost approximately $6.5 million dollars over a 20- to 30-year period (7 to 10 years for planting followed by 20 years of monitoring, maintenance and stewardship). This total is in comparison to an estimated one-time payment of $15 million the City of Medford would have spent on a grey infrastructure solution. The natural compliance solution of planting trees is significantly less expensive for regional rate-payers, with costs spread out over several years. It’s important to note that the Medford trading program is a compliance program designed to maximize environmental benefit; it is not simply a restoration program with a few compliance perks. The Medford program is a wastewater infrastructure project that includes riparian restoration actions. Therefore, much of the cost associated with the Medford program is to ensure it has credibility as a permit compliance program and can meet the rigorous requirements of the Clean Water Act. The additional benefit of this investment is that the quality of the credit-generating riparian projects is often higher than traditional restoration programs because they’re funded to a level that promotes rapid implementation of large acreages and ensures the successful development of planted vegetation over 20 years. That still seems like a lot of money for that amount of restoration. What are the costs of the program? On a per-acre basis, the cost of the Medford water quality trading program is greater than the per-acre cost of many grant-based restoration programs, such as those typically implemented by local groups using funds from Oregon Watershed Enhancement Board, or local landowners using USDA conservation incentive program dollars. The costs of the Medford program must incorporate the additional cost of long-term site maintenance and monitoring. Planting sites must be maintained and monitored over many years – 20 to 30 versus the typical three to five – in order to ensure that intended environmental benefits are being achieved. The Freshwater Trust must also conduct monitoring and reporting necessary to meet a regulatory standard to assure the public that the trading program is working. The chart below illustrates some of these differences. Why do you pay landowners? Participating landowners are making a significant long-term commitment. The acreage being planted on their property is retained exclusively for the purpose of ensuring full development of planted vegetation over the 20-year life of the project. Landowners must also provide access to the project area for the purposes of monitoring and maintenance, so an annual payment helps offset the burden of such restrictions. Compensation makes recruitment of important sites more practical. Landowner compensation is in line with other conservation incentive programs, such as those offered by USDA. Site selection is a two-step process. First, The Freshwater Trust uses project-specific GIS tools to identify sites that have good restoration potential. This work evaluates sites on a number of factors, including credit-generating potential, environmental benefits and endangered fish habitat value. Based on the outcomes of our GIS model (known as the StreamBank® BasinScout™ methodology), staff contact landowners and propose projects. The second step is negotiating terms with landowners for a long-term commitment. Once the decision to move ahead occurs, the project details are agreed to and recorded in a signed lease for the life of the project. Our objective is to maximize conservation actions within the available budget, within the bounds of the trading region and compliance requirements. Does this program have other benefits? Given the nature of Medford’s discharge and temperature dynamics in the Rogue River, the Medford facility would have needed to use their grey solution (an effluent storage pond) for two to four weeks each year in the month of October. That’s a lot of rate-payer money and infrastructure for only a few weeks of operation each year. Instead, the watershed approach is not only cheaper but it’s permanent. Once established, the planted trees produce shade benefits year-round, even when compliance is not at stake. That means water temperature and the fish that depend on cool temperatures are benefitting when it really matters, especially when the sun is hottest and flows are lowest in the mid to late summer. Approximately 100 acres of streamside forest will be restored as a result of this program. New trees provide valuable habitat (including insects that form a key part of the aquatic food web), sequester carbon from the atmosphere, stabilize riverbanks, and absorb nutrients from agricultural and residential runoff. Over time, trees also fall into the river, naturally improving habitat complexity in the river. So if I put a thermometer in the river, will it be cooler? The short answer is that it depends on where you put it. This one program by itself will not lower the general average temperature of the entire Rogue River because it’s addressing only Medford’s contribution to the Rogue’s temperature problem. There are other dischargers in the Rogue basin each contributing to the overall temperature problem, however, the nonpoint source impacts in the basin (lack of riparian vegetation, irrigation withdrawals, and channel modifications) play a much larger role in the warm water temperatures than the point source impacts. The planting sites do create valuable pockets of shade where salmon can rest, spawn and rear. Over time this program---when combined with additional conservation work and other trading programs---could restore hundreds of stream miles involving thousands of restored streamside forest acres, which would make a measurable difference on the river's temperature, particularly in critical areas where fish need it most. In other watersheds with many dischargers, such as Oregon’s Willamette River, Idaho’s Boise River, or California’s San Joaquin River, the cumulative effects of water quality trading across many facilities may have a significant impact on the regulated parameter. This is what we mean by the “scale” or size of programs to make a difference. The biggest benefit of water quality trading are often these broad environmental benefits. If Medford had built a storage lagoon, it would have spent more than twice as much money, while abating a small percentage of overall temperature effects on the river, and none of these ancillary ecosystem functions would have been restored. This overall context of the program is important to keep in mind when evaluating program efficacy and value.